From what JONA is saying, it doesn't sound like you can actually kill the plant. That being the case, what if you dig a trench all along the fence line, then put some kind of a barrier in it -- weed mat? line trench with weed mat and fill with gravel? corrugated roofing panels? sheet metal? Once you put a stop to the incursion, you can deal with what's on your side of the fence and know it's gone. And offering to help your neighbor get rid of it is a great idea and a wonderful gesture. thanks everybody for all your wonderfull help! so what kind of damage does this plant do? Does it choke off veggies? Noxious? Ugly? I don't think it's ugly at all. It looks like morning glories, with white flowers. Sometimes the flowers have a little pink tinge in the throat. Kind of pretty, in fact. Yes, it chokes everything it grows on ... trees, shrubs, hedges, you name it. And it spreads by both runners and seeds, so once it gets a foothold, it just grows rampantly. Everywhere. Constantly. It's as bad as English ivy. Maybe even worse. I hate the stuff! Back in the early 80s, when I finally resorted to Roundup to get rid of it, there was no "generic" version of that product. My SO and I had just bought that house, and were trying to put in a garden. We literally dug out bindweed almost daily for 3 solid years. Although neither of us liked the idea of using an herbicide, we finally decided that it really would be nice to have time to do something else at some point in our lives, other than dig out bindweed. Kisal wrote: Yes, it chokes everything it grows on ... trees, shrubs, hedges, you name it. And it spreads by both runners and seeds, so once it gets a foothold, it just grows rampantly. Everywhere. Constantly. It's as bad as English ivy. Maybe even worse. I hate the stuff! I would say it's much worse than English Ivey. Grows so much faster, it took only 4 days to smother a 6 foot tall sunflower. As far as the fence goes, I'd use thick heavy plastic to make the barrier, and dig it down a good 2 feet. Sound ridiculous digging down that far, but bindweed is that hard to control. I purposely grew it at my mother inlaws house, but only because I knew my mother inlaw wouldn't take care of her plants and it's very hardy here. That and it covered a 15 foot fence ver easily. it's sad to have to resort to roundup, but if everyone were as reluctant and well informed as the people on this thread, pesticides wouldn't cause so many problems. My dad used it for a huge poison ivy vine. He filled one of those little ampoules you get on the tip of roses, stuck in the end, and let it go for a few days. Total eradication. Seemed like a good use. Oh man I just turned less organic! Toil wrote: Oh man I just turned less organic! I oughta slap your hand but mine still hurts from slapping myself for kinda somewhat recommending (mumble mumble under my breath) Roundup. Their page about Convolvulus arvensis, aka bindweed, aka wild morning glory, aka several other things. cynthia_h wrote: ... aka several other things. Yes. I have called it many different names. Most of them aren't fit to print. Sometimes it's difficult to be sure that we're talking about the same plant (a client's office space is dealing with bindweed...) without the scientific names. However, in the case of this little beast, the scientific name itself has been a source of confusion. Most of the beautiful morning glories gardeners *like* to grow--the reds, purples, blues, etc.--are different varieties of Ipomoea spp., which belongs to the Convulvaceae family of plants (which is absolutely huge). Good luck with C. arvensis. ok i am 100% sure its bindweed not morning glory. 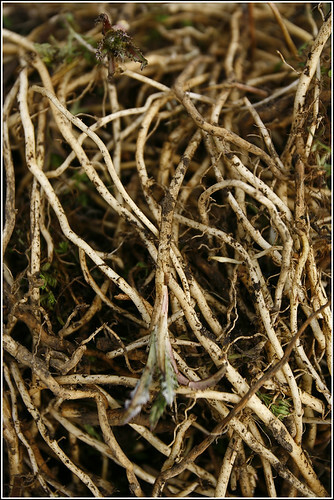 heres a pic of the roots that i have been digging out!! !